Here is a short entry. 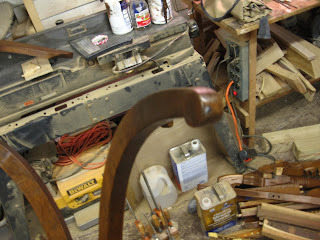 I wanted to post a photo of the Eastlake chair I have been working on with the restored finish. 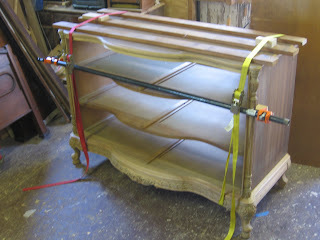 I will post one more photo with the Upholstery in place. 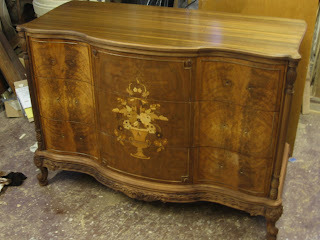 While the chest of drawers is fairly modern, the veneers used in this piece are quite nice. 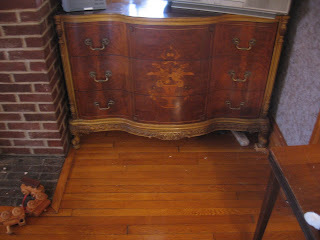 The piece sustained damage to its top due to falling plaster and damage to the drawer fronts due to water spray. 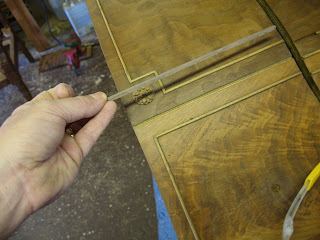 The finish used on this piece is a factory sprayed laquer which is not a restorable finish. The chest originally had the carved sections painted with a gold paint, but since we had to remove the finish from the rest of the piece, we nemoved the gold paint as well. 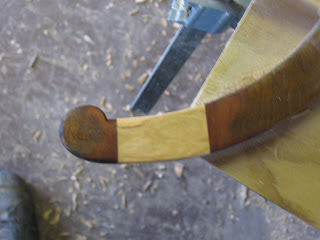 I stained the carved areas, which were naturally much lighter then the veneers, to match using aniline dye stains. 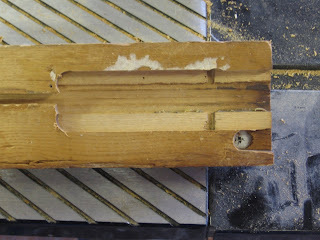 After all repairs were done (including reattaching a loose top) I began the finishing process. 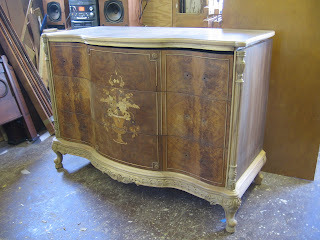 I will post pictures of the completed chest after I deliver the piece. 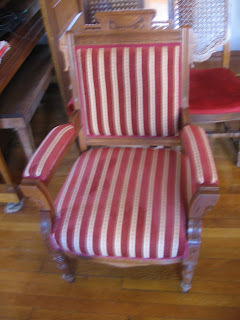 The chair I received had gotten some water damage to the finish and the fabric. 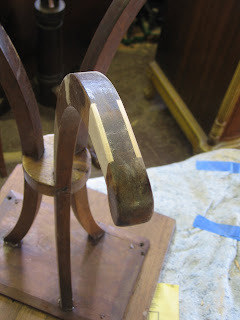 Whenever a chair comes in for reupholstering I take the opportunity to check the joinery and glue the chair if necessary. 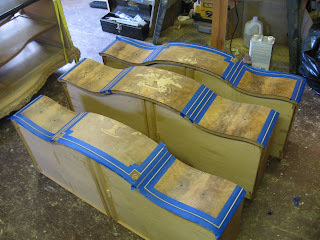 In this case, the last upholsterer had glued the joinery with a hot glue gun which does not hold up for long. 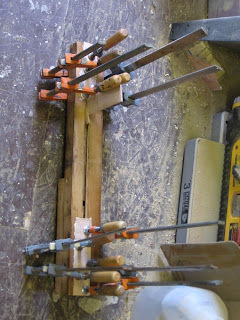 As a result, every joint in the chair had come unglued. 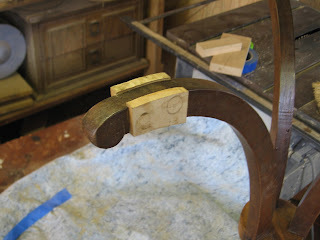 This post covers the removal of the upholstery and the gluing of the chair. 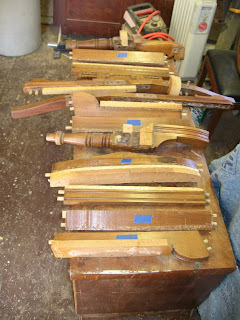 As I move on to the finishing process and the recovering of the chair I will post separate entries. The Chair as it came to me. 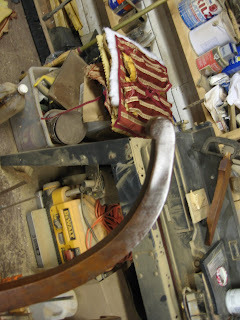 The chair with the upholstery removed. 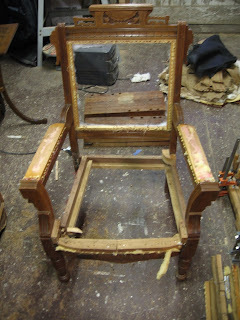 The chair completly dissassembled with all upholstery staples removed! 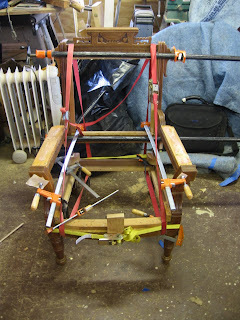 After all of the joints have been cleaned of the old glue the chair is glued. This entry has a first part which is several entries ago. 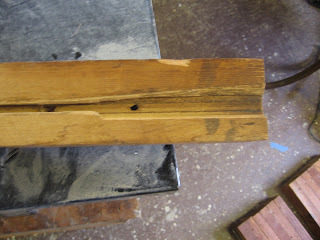 After gluing the patches in place the next step was to remove the excess wood and sand the patches until they were smooth and flush with the old wood. 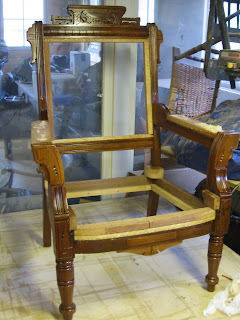 The last step was to stain and touch-up the patches and add finish to them. Below are some photos of the process.